Two days to the expiration of their tenure, some governors have jetted out of the country, thereby refusing to personally hand over power to their successors. They include Jigawa State Governor, Sule Lamido, and his Katsina State counterpart, Ibrahim Shema. Also, some governors, who did not travel out, have decided to shun the inauguration ceremonies of their successors. Preparations for the inauguration of the nation’s 4th Republic intensified on Wednesday with Nigeria and the international community gearing up for the ceremony. The President-elect, Muhammadu Buhari, is expected to be inaugurated as the country’s Chief Executive and Commander-in-Chief of the Armed Forces while governors are expected to be inaugurated in their respective states. Lamido left Nigeria last week after handing over to the Secretary to the State Government, Alhaji Abdu Babura. The governor, whose tenure expires on May 29, had before departing Nigeria for Saudi Arabia told newsmen last week Thursday that he was taking a well deserved rest. At the conference, Lamido confirmed that he was leaving behind a debt of N2bn. Putting the debt issue in perspective, the governor explained that of the N14bn debt in the name of the state, N12bn, which his administration used in the construction of the Dutse International Airport, was owed by the Federal Government. Like Lamido, the outgoing Governor of Katsina State, Ibrahim Shema, has jetted out of the country ahead of the inauguration. It was gathered that Shema had last week Thursday left the state on an official trip to Abuja. Further checks revealed that the governor had after performing the official inauguration of the state’s housing complex in Abuja, last weekend, left the shores of the country on Saturday night. It was learnt that the Secretary to the State Government, Mukhtar Ibrahim, would represent Shema during the handover ceremonies slated to be held at the new multi-million naira Karkanda Stadium. This is coming at a time when it is becoming clearer that some Peoples Democratic Party governors, who lost their states to the opposition All Progressives Congress, have concluded plans to avoid being physically present when their successors take over the reins of governance. The Rivers State Governor, Mr. Rotimi Amaechi, has said that he will not be present at the swearing-in of his successor, Chief Nyesom Wike. There had been speculations that Amaechi may not be present at Wike’s inauguration as a result of the controversy surrounding the presidential and governorship elections in the state. But Amaechi, who spoke through his Chief Press Secretary, Mr. David Iyofor, explained that he would rather be at the swearing-in of the President-elect, Muhammadu Buhari, on Friday, in Abuja. “Governor Amaechi at the inauguration ceremony of Wike? He (Amaechi) plans to attend the swearing-in of the President-elect, Muhammadu Buhari,” Iyofor said. The Executive Assistant to the Plateau State Governor, Mr. Clinton Garuba, confirmed that his principal, Mr. Jonah Jang, is most likely not going to attend the handover ceremony. Garuba explained that Jang was likely to heed the advice of his close aides to steer clear of the inauguration of his successor, Mr. Simon Lalong, on Friday. He revealed that the outgoing governor had already written a letter inviting Lalong to the Government House, Jos, to collect the handover notes on Thursday. 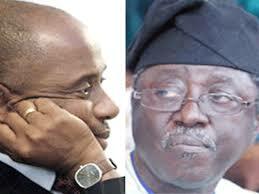 Garuba said, “Since it is the Chief Judge that swears in the governor, Jang has no role to play there. He is more or less going there as a spectator. So, we have advised him not to go but he has the discretion to heed to our advice or not.